Following last year's first attempt at travel writing I'm having another go. It's a similar trip but to different islands. I hope you find it interesting. This time the flight looks like leaving on time. We're waiting at the gate to board the Sabre Airways 737 and everything seems normal. Then comes the announcement: it seems that one of the cabin crew has had an accident on board and will have to be replaced. This doesn't sound good. Where do you find replacement crew at 23.15 on a Friday. Good news. It's 23.45 and the decision has been made to go with one crew member short. We take off at 00-15 just three quarters of an hour late. This will be no problem at all to us as we will have plenty of time to get to Piraeus before the boats leave. It's a good flight and the crew are efficient and friendly despite having to cover for their injured colleague. We arrive at Athens Airport 05.30; our packs don't! It's terrible feeling, watching your fellow passengers taking their luggage off the carousel and leaving, the hall gradually emptying and the final realization that your luggage is not going to appear. It's not one pack but both of them! So Jude and I are standing alone in in an empty hall with what we are standing up in and a tiny pack containing our hand luggage. We soon find the lost luggage office and our loss is duly reported. We're told that when (or if) the packs turn up they can be collected from the airport or , if we prefer, flown on to any airport in Greece. It doesn't take us long to reach the decision that rather than waste time waiting to see if the packs arrive later that day we should proceed to Naxos as if nothing had happened. We had made a quick check on the hand luggage and we really had most of the essentials: money, traveller's cheques, credit cards, passports, flight tickets, camera etc. Anything we didn't have we could buy on Naxos if necessary. The good part was that we were now really travelling light. Our packs had weighed in at only 13kg between them, but now we were down to a total of 5kg. So despite everything we boarded the Piraeus bus in good spirits looking forward to this new dimension to our adventure. The 07.03 bus from the airport arrived in Piraeus at 07.50, just like last year. Again we were delayed severely by the rush hour traffic but arrive at exactly the same time. We received the attention of all staff members in the nearest ticket office to get the tickets issued in time and we ran the two hundred yards to the boat which was leaving in five minutes. It would have been hard work with the packs! By the time we reach the sun deck the ramp is up and we're leaving. Most seats are taken but we find a couple of patio chairs and settle down. It's really hot in the sun but we know it will be cooler once we reach the open sea. We hadn't had time to buy suntan lotion so we're going to burn if we're not careful. Jude produced something from her bum bag that she says will do the trick. It's a dark red lipstick including a total sun block, so here I am smearing lipstick on my nose! The Express Santorini is one of the better ferries. It's reasonably clean and there are well stocked bars and restaurants for the lower classes. We almost always travel deck class, not for reasons of cost but we like to be out in the air. It may not be as comfortable as a cruise but you see the same scenery and you breathe the same air. We discuss our dilemma and realize that most of the things in the packs are luxuries rather than essentials. You don't really need changes of clothes and cheap beach towels can be purchased on arrival and discarded at the end of the trip. We will make sure that we don't exceed the 5kg each hand luggage allowance next time, then we won't have to lose sight of our packs. It's 12-15 and Paros is in sight ahead with Mykonos in the distance behind - sorry, astern. We're just overtaking the Apollon Express on the port side and there are three other ferries heading for Piraeus and we're catching up with another. The sea has remained reasonably calm up to now: not much sign of the Meltemi yet. PAROS - 12.55. As inviting as ever, Paros looks wonderful from the deck. The whitewashed building are glistening in the burning sun. We're ready for lunch but can hold out until we reach Naxos. The scene is even more chaotic than usual. There are three ferries in port together, all disgorging their cargos onto the tiny quay - trucks, people, animals, all manner of goods in sacks, boxes and pallets, sack trucks, mopeds and motorcycles, some with impossible loads, policemen with whistles, buses, priests - the whole world and his dog! Once again we are amazed by the efficiency of this seemingly disorganized chaos and within twenty minutes we are away again and on our way to Naxos. After a short trip around the north of Paros we're soon docking at Naxos. It's 14.00 and we feel as if we've arrived home. It's taken us a long time to come to the decision but Naxos has to be our favourite island. If we had to choose one to spend two weeks (or months) on, this would be it. We're waiting on the car deck as the ramp goes down and are with the first group to disembark. We know what to do and we're soon at the little booking office on the quay to sort out our accommodation. Within minutes we're heading through the town with Nikos in his minibus on our way to see his rooms at Marina Studios. We asked for a room in the quiet side of town near St George beach and we're put in the capable? hands of Nikos. The rooms are in a small block up a side street and are clean and comfortable with an en -suite bathroom, balcony and fridge. There's also an electric ring good enough for warming the water for coffee. You would not want to do any more in the heat of the summer. What a system - by 14.30 we're settled in our room. We still haven't had lunch but the first job is to inform Athens Airport that we are in Naxos and find out whether the packs have turned up. Having purchased a phone card at the local supermarket the call to the Airport number is answered quickly and we soon learn that our packs have turned up. There's a flight this afternoon but it is unlikely that it will be possible for them to get the packs across from the charter terminal to the west terminal in time. However, they will try. We phone back in ten minutes as requested and they regret that it will not be possible. They will try to put them on the morning flight. I give them Nikos's restaurant telephone number from his card and they promise to phone back to confirm. Now we have to find Nikos's restaurant so that we can explain what is going on. The restaurant is called The Good Heart and first impressions are that they live up to the name. I explain who we are in my best Greek. Nikos is not there but his wife and daughter immediately make us feel at home. They explain that the Airport have phoned to say that the packs will be on the 09.00 flight tomorrow and that Nikos will take us to the airport. By now we are getting really thirsty and hungry. We order Amstel and ouzo. By now Nikos has arrived and delivers us a plate of olives, feta cheese, octopus and tomatoes as a meze - a good appetizer. We decide to follow this with a pizza and salad. By now it's around 20.00 and we're getting tired after a very long day: it's 35 hours since we got up for work yesterday and we've had about two hours sleep since then. So it's early to bed and a long, sound sleep. Nikos is as good as his word and he's waiting for us at 09.00. The plane has arrived by the time we arrive at the airport but the bags have not! Back in town we phone the Athens office to be told the story that our packs would have taken the plane over its weight limit - at 13kg they were obviously the straw to break the camel's back! They'll be on the 16.00 flight this afternoon - perhaps. No we have no alternative but to go shopping. We will keep it to a minimum but will have to buy suntan lotion, shorts and beach towels if we want to go to the beach - and we do. So, by 10.30 we're kitted out waiting for the bus to Plaka beach. We realize we've just missed it so treat ourselves to a passing taxi. It will cost us 2500drs but we reckon we've earned it. So, after picking up the local priest with his long beard and cylindrical hat for a free ride, we're soon sitting in one of the beach tavernas with a cold Amstel - we've earned that too! It's about 13.00 when we hit the beach but that's fine as we don't want too much sun on our first day. Plaka has to be the best beach in Greece for us. There are bound to be better but it has everything we want - clear water, white sand backed by dunes, a sand road with plenty of traditional tavernas and even a bus every hour back to town. After a couple of hours relaxing in the sun we retreat to the nearest taverna for lunch and after another hour on the beach we catch the bus back to the airport. The plane has just landed so it's fingers crossed as we enter the terminal building (more like a taxi office). I can see our bags immediately. We stand aside and wait for the chaos of the departure procedure to end before approaching the office to hand over our document from Athens Airport containing the essential reference number that should see us reunited with the packs. All seems well at first but on checking the contents I find that my Minolta binoculars are missing. It is no surprise really; I should have carried them with the hand luggage. It could have been much worse and that's the way we're looking at it; there's no point in crying over spilt milk. The lost bags experience had not by any means been a bad one. We have found that we really could manage with a lot less than we bring and we've been treated once again to spontaneous Greek hospitality. As I write this, I'm sitting on the balcony while Jude is scalding herself in the shower. These roles are soon to be reversed. Nothing of interest to report - relaxing on Plaka Beach during the day an eating well in the town at night. We're on the move again. For a long time Jude has wanted to visit the Small Cyclades islands south of Naxos, and today we're going to do it. We bought tickets for the Express Skopelitis to Koufonissi leaving at 15.00. It's cloudy - really cloudy. I can't remember ever seeing so much cloud in the Aegean at this time of year. It will soon clear I'm sure but will there be rain first? Surely not - it's almost unheard of. We have been surprised that the wind direction has been predominantly from the south since we arrived on Naxos. Normally there are no more than three days of light winds before the Meltemi kicks in with force sixes to eights from the north. You only have to look at the skid marks on the runway at the airport to prove the point: it runs north/south and the south end is completely black with rubber whereas the north end has just a few marks. It's 10.30, we've had our breakfast of croissants, yoghurt and honey and it's time to pack. Nikos has offered to pick up our packs and take them to the restaurant in time for the boat so we walk the mile or so to the The Good Heart to pay for the room. No sign of Nikos. No one seems to know where he is but "he'll be back in ten minutes". After an hour and a half, sure enough here he is and he's got the packs! By this time we've ordered our lunch, so, after the meal we sort out the bill for the room, say our goodbyes and make our way the three hundred yards to the quay to wait for the boat. On the way we realize that this is the first time we've carried the packs any distance since we left home - quite an achievement! The Skopelitis is only ten minutes late and we're soon up on the sun deck. It's crowded but we manage to get a seat. First stop Paros: not the main port of Paroikia but the little port of Drios in the south east. - looks good. Perhaps we'll try it on the way back. Next stop is the island of Iraklia. The sleepy little port area gives little away. We can see the edge of a village on the ridge behind the port but that's it. Eight or nine people leave the boat and a handful get on. I always wish I had time to see more at this point, but we've made our choice and we'll stick with it. Next stop Schinoussa. Again, more get off than get on and there's certainly more life here judging by the traffic - there must be at least six cars and trucks and a dozen people! Again though, there's very little to see from the port. Next we pass the uninhabited island of Keros on the right and the almost uninhabited Kato Koufonissi on the left. Koufonissi (or more correctly, Anno Koufonissi) is up ahead and look inviting with a windmill to the left of the port and a crescent shaped beach to the left. Little fishing boat bob in the shallows between the port and the beach making an attractive scene in the late afternoon sun. There don't seem to be many people offering rooms. There's a car with a quaint passenger-carrying trailer attached and a luggage trailer behind that, a couple of pick-ups and a mini-bus. We spot a lady standing to the left and as we walk towards her she utters the welcome word "rooms?". She leads us up the hill towards the chora and I can feel my heart pounding at the sudden shock of being forced into action to cope with the unexpected weight of the pack. "Couldn't you have asked her to carry it for you? ", it seemed to be saying. Fortunately, hers is one of the first houses at the top of the hill and it looks promising. She leads us to the room with the best view across the straits to Keros and we soon agree a price. 12 000 is the lowest she'll go, but with rooms obviously in short supply we're happy. After a quick scout around the chora and port, which revealed a good selection of bars and restaurants but few shops, we stopped for a drink at a little bar at the far end of the beach. The change of pace compared to Naxos immediately became apparent when we ordered. There was a noticeable "turbo-lag" before the message got through. the couple at the next table had also ordered and when the barman attempted to put their drinks on the table he lost concentration on the tray and tipped one beer over the lady's smart dress. The mess was duly cleared up and the drink replaced and during the performance the couple realised we were speaking English. They struck up a conversation and sounded Scandinavian - there are a lot of them about in these parts. However, they turned out to be Irish, from County Cork and they shouldn't have been on the island at all. In fact they didn't even know which island they were on! We provided the required information and they proceeded to explain. They had been on the Skopelitis with us but had boarded at Mykonos some hours earlier having flow there from Athens in the morning. They had flown from Ireland to London Heathrow and on to Athens the previous day and stayed the night in a luxury hotel. (By the way it had rained heavily in Athens - almost unheard of at this time of year. Their travel agent had booked them a 5-star hotel on Paros but had failed to arrange any connections between Mykonos and Paros, leaving them to make their own arrangements. 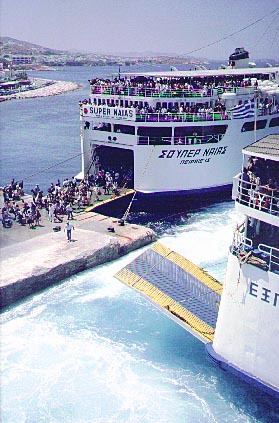 Not knowing anything about Greek ferries, they had boarded the next boat for Paros. Little did they know that not only was it the slowest boat but it was also the only one that didn't call at the main port of Paroikia (where their hotel was situated). Instead it called at Drios at the other end of the island. To make matters worse - much worse - by the time they had got their luggage to the exit the ramp had been raised for departure by the time they got there. The only thing they had done right, by pure luck, was to stay aboard at Iraklia and Schinoussa as there is at least one boat a day back to Naxos and Paros from Koufonissi. They were all set up for a 5-star holiday (one week) and were now spending a night in a basic room with no air conditioning. they had also found that there was no way of getting back from Paros to Mykonos on the day of departure in time to catch the flight back to Athens, so it looked as though they were going to have to lose another night in the hotel. I think that left them with four nights at best! So, having guided them to the travel agent's office in the chora we left them - bemused. I'm sure that was far from the end of the story but we didn't see them again. Decided to try the fish restaurant we could see from our room: it couldn't be more than 100 yards away. We could see it, but could we find it? Not a chance! Finally a friendly local showed us the way - through someone's house, and across someone else's back yard. It should have been obvious shouldn't it! "You know how I know?" he laughed "The restaurant owner is my brother." The service was "relaxed", but I was eventually treated to one of the best pork souflakis I've ever had. After a wonderful sleep we do some more exploring around the village and after a quick breakfast we jump on the beach boat at 11 o'clock. It turns out to be the boat for the almost uninhabited island of Kato Koufonissi with a simple choice of pebble beaches and a taverna at the first stop (called, rather spookily "Taverna") or a black sand beach called Nero with no taverna. As we're unprepared for no taverna,"Taverna" is an easy choice, if you get my drift. It's a good choice - at least, we don't know what the other place is like but this is good enough for us. After a quick drink in the quaint taverna with its on-site bakery and fascinating looking home cooking, we retreat to the pebble beaches and spend the afternoon in total tranquillity with our own beach and water as calm as a swimming pool. As we board the boat for the return trip at 17.00 we are already looking forward to returning to try lunch or dinner in the taverna. It didn't happen, however, but we'll return one day. The shops in Koufonissi are amazing. We haven't seen anything no totally disorganized since Armenistis on Ikaria in 1981. There are two shops competing for the untidiest shop in Greece award. There are things in those shops that could be put on display in the Athens Archaeological Museum! Everyday items like lobster pots and gas lamp mantels are close at hand but more obscure items such as toilet rolls or tins of beans require the erection of scaffolding to get within reach. The counter is totally beyond reach due to the various boxes of crisps, water and debris between you and it. I've put this sketch from my journal in, but there's no way I am capable of capturing the atmosphere of the place - it would test an accomplished artist! Further wanderings in the evening bring us to the Windmill Bar, unsurprisingly standing on the highest point in the village. The position is perfect. It faces south and the bar to the east side of the windmill itself boasts uninterrupted views in a wide panorama from east to west - just the place for a sun-downer. In fact, the meze supplied with the ouzo is a meal in itself: olives, home-made cheese, octopus... No wonder ouzo is never quite the same at home! We don't stop at that of course. The first restaurant in the direction of the village is filling up early - always a good sign. I'll just have the fish soup I think; I'm not really hungry after the meze. When it arrives I can't believe my eyes. There's a huge bowl of soup accompanied by a three pound red snapper! It causes quite a stir even amongst the party of Greeks at the next table. The initial shock soon faded and after working out how to tackle it - just remove chunks with your fork and drop them in the soup seemed to be a sensible method - I really enjoyed it: a memorable meal and all for 2000drs. Decided to walk along the coastal track to the east of the village to find a beach. The string of coves that appear as soon as we left the village surprise us. The beaches look perfect and the clear water and rock formations promise good snorkelling. We are even more surprised by the level of development. Villas and tavernas also stretch for quite a distance and there's a large campsite standing behind one of the best beaches. It's still early and the beaches are quiet but it doesn't take much imagination to picture it in a few hours time. We decide to keep walking as there's a fresh breeze and the air is clear and refreshing in spite of the rapidly rising temperature. We're pleased to find that after passing the campsite there are buildings to speak of and the coastline becomes more and more dramatic. So we keep walking for what must be about a mile and a half, the path climbing gradually but still roughly following the deeply eroded cliffs. In places the sea has undercut the cliffs to such an extent that walking along the path doesn't seem like a good idea and we keep well inland. We reach the top of a headland and suddenly the view towards the northern coastline opens out in front of us, and it's stunning; a long, crescent-shaped sandy beach cuts into the eastern coast, sheltered from the north by dramatic hills leading to cliffs that drop into the wild north facing sea. The calm water in the bay is a wonderful aquamarine colour and is reminiscent like a Caribbean scene, especially with the sleek yacht at anchor in the shallow water. We make our way along the beach and unfortunately it's quite busy. There's obviously a road of some sort crossing the island, and it's been negotiated by a large number of assorted 4x4s and motorcycles.The trouble is these days that as soon as someone finds a good beach the mobile phone is out and the whole world is invited along! To say the mobile phone has become popular in Greece would be an understatement in the extreme. It seems that everyone over the age of fourteen has one and even the kids have a toy one that makes all the irritating chimes of a real one, except more often. You can be in the most atmospheric situation watching the sun set or rise, or overlooking the cauldra in Santorini lost in your thoughts, and you can be sure someone's phone will start chiming The Sting. It's amazing the whole system doesn't collapse under the strain, and the population collapse into poverty due to the size of their phone bills. Let's just hope all the health scares have no foundation. We would have liked to have stayed in Koufonissi for another day but Helen tells us the room is booked. Rather than trying to find another room just for one night we decide to take the 09.30 boat back to Naxos (Express Skopelitis). A quick breakfast in the village after packing and Helen greets us back at the room. We are invited up to her rooms on the top floor and after we have settled the bill and Jude's passport is returned, she presents us with a plate of heart-shaped mini-ice creams covered with chocolate. We go out on the balcony where Helen proudly shows us her view. We learn that, like many of the room owners on the islands, she lives in Athens in the winter. She also tells us there was torrential rain in Athens last night - weird. It never rains in Athens in July. So we're off to Naxos again. The sea's calm and it's a very pleasant cruise. We call at Schinoussa and Iraklia but not Paros. Instead, we sail up the Naxos coast and are able to see just how extensive the beaches are. We pass the little hamlet where we stayed on our first visit to Naxos in '93 and are pleased to see that it looks much the same. However, one of the best beaches appears to be in the process of being ruined. A large hotel complex is rising up from behind the sand dunes. This will spoil what appears to be an idyllic camping spot, but I suppose it's inevitable. Back in Naxos at 11-45 and we quickly decide to take the Naias Express to Santorini as we would like to visit the Akrotiri dig again. The boat leaves at 13.45, so we go to a cafe for a drink and Jude goes off to the bakery for some of their amazing salad batons. We're back at the port at 13.30 but the boat doesn't arrive until 14.30. Is this by design? I think so. It's a good way of reducing traffic congestion in the town. The tourists are safely in the port long before the locals need to be there. That's fine. We've got plenty of time but they've got businesses to run. The chaos in the port is certainly not diminished though. Three boats arrive within minutes of one another and there's so much traffic with vehicles all filtering off the boats on to the narrow quay that there is no way of getting the foot passengers to the boat until all the vehicles are cleared. Eventually of course we are allowed to embark and there's plenty of room on the sun deck - something of a misnomer as a blue plastic canopy covers 90% of it. We chat with a young Swedish couple who are in Greece for the first time. They are enjoying it but are not impressed with the Greek's apparent disregard for keeping places clean and tidy; this boat, for example, is anything but ship-shape. They are right of course, but you can't compare Greece with countries such as Sweden, but that's part of the charm of the place. Clinically clean places can have all the atmosphere of a clinic! At least the toilets have improved out of all recognition over the years and that has to be good. There's nothing positive to say about the way they used to be. The Swedes were quite happy about this aspect. they had toured China last year and said the toilets were all disgusting beyond description. We arrive in Santorini at around 17.45 and words just can't describe the scene as you sail across the cauldra towards the port with the villages perched precariously on the top of the 1000ft cliffs, so here's a picture. We're soon deposited on the scruffy port. Chaos again. You can't move for people, and the traffic coming down to the port is trailing as far as you can see up the hill. We head for the nearest office to enquire about rooms and agree to the Perissa Beach Hotel at 12000drs per night with a free transfer. Eventually, along with six or seven other and their luggage, we are loaded into a battered Mark 2 Ford Transit minibus (low headroom model). We set off up the hill (the side of a 1000ft cliff. Memories come flooding back of the last time, when the old overloaded bus was struggling for the power to take the hairpin bends and yet overtook another bus between the bends. It was dark on that occasion and it frightened me to death. This time was little better. the newer, smaller minibuses were passing us and diving back into the line just before the next hairpin bend. One of them almost didn't make it and was within inches of a head-on collision. The consequences of an accident on that stretch of road just doesn't bear thinking about, but I did - all the way up! "Is that low stone wall (the one between us and oblivion) strong enough to stop a severely overloaded Transit with failed brakes?" and "I wonder what became of the people in the vehicle that made that hole in the wall." and "I wonder how long it will be before the next vehicle passes us travelling vertically downwards from the road above." A vivid imagination, some knowledge of the fallibility of motor vehicles and their drivers, and severe vertigo are not a good combination on a journey like that. Ignorance is bliss..... If I were wise though, I'd steer well clear of Santorini! However, we made it to the top to my complete and utter surprise and relief. The remaining couple of mile to the hotel pass uneventfully but "hotel" turns out to be yet another misnomer.